I hadn’t been for a walk around Ossining in five or six years, but a couple of weeks ago the weather was lovely and my wife had gone out shopping. She had the car so I decided to take the dog for a walk down to the Ossining waterfront. During our walk the signs of Spring were everywhere – trees and flowers were blooming. When we first moved to this area about twenty years ago I recall thinking of Ossining as a fairly typical old Hudson River town: a bit seedy, not terribly interesting and economically a bit depressed. We went to see presentation on “Historic Downtown Ossining” given by the Ossining Town Historian. Very interesting if a little long – at least it seemed that way but that might be because we were very hungry. The presentation showed how a large part of downtown Ossining was lost to urban renewal and in 1970s. One entire side of main street disappeared and wasn’t really replaced with much. Very Sad. A lot of old photographs were shown, many in the form of before/after shots. It’s startling how much was lost. 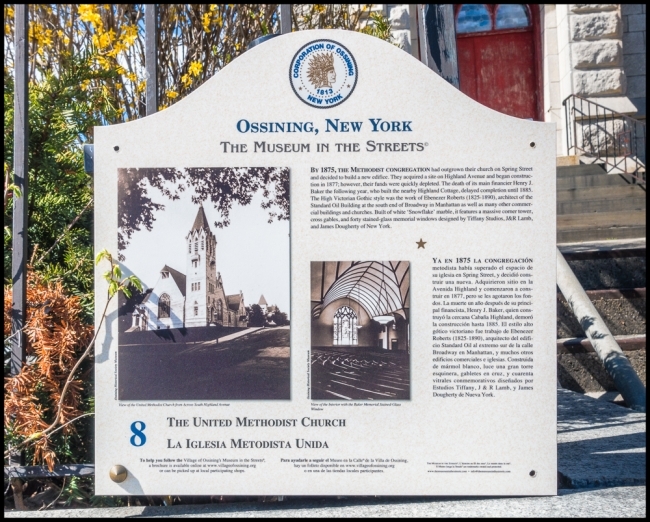 Many of the historical buildings in Ossining have now been incorporated into a scenic tour, each one described by a historical marker such as the one above. A number of new restaurants have opened up, including “3 Westerly“, which has a particularly scenic location right on the renovated waterfront. A new park has opened along Ossining Kill featuring the interesting double arched viaduct.